BIBEAU are five talented young guys from Texas, who just put out their self-titled debut album. They can be best described as a Progressive Rock band firmly rooted in the classic Rock tradition, but there are also notable Heavy Metal influences in their music. One can tell that these guys are really into RUSH or FATES WARNING and some NWOBHM and early US Thrash metal bands. BIBEAU are a traditional rock band, they are progressive more in the sense of being inspired by certain 70s and 80s rock bands then by virtue of pushing the boundaries of rock music or being a band that doesn’t fit into any genre categories. That being said, they are not derivative, the band is able to weave various influences into a coherent whole and make their songs sound fresh and original. At lest for the most part, there are moments that feel unashamedly retro, like the almost seven minute long song “Phantom of the Opera” where the IRON MAIDEN and early METALLICA influences loom large. “Phantom of the Opera” is a bit of an outliner though. A number of songs here are quite atmospheric, some don’ t even feel very Prog in terms of being too epic in scope or very complex. The shorter, laid-back songs like “The Color Blue”, “End Of Us, End Of Time” or “Brand New Shade” have these sweet cascading riffs that create a wall of sound that engulfs you like a flowing river. If you’ d listen to these three songs in isolation you would think that BIBEAU are some Atmospheric Rock band. But although they are not particularly progressive the band knows how to jazz them up and make them an interesting listen – the talent on display here is undeniable. It’ s the longer songs on the album that show the more Progressive side of the band like the ten minutes long closer “Play By Feel” or “Mother Of Pearl”. The latter one is one of my favorites on this LP as it opens with a sorrowful ballad part. After this section, the song transitions to a quite animated part. It reminds me of the newer FATES WARNING material, which can only be a good thing. Other memorable songs are “Leeway” and “Mark This”. 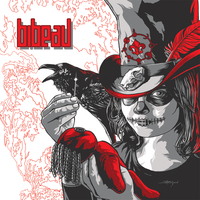 Although the latter song features heavier riffs it still has an almost uplifting vibe typical for BIBEAU. What makes the difference between a good record and an excellent record to me is often times that the music speaks to me on a personal level. In this case it’ s the sheer quality of the musicianship that tipped the scale over. Personally I admire this record more then I enjoy it, but that being said there is a lot to enjoy here – many memorable songs, mature songwriting, jaw-dropping instrumental and vocal performances. I can wholeheartedly recommend this album and I’ m very interested to see what this very talented band will come up with next time.